The English Cocker Spaniel temperament is second to none. They're loyal, companionable, gentle and affectionate. If you'd like to know more about the traits and personality of this wonderful Spaniel breed, read on. What's The Cocker Temperament Like? The Cocker Spaniel temperament is gentle, loving, and loyal. They're very friendly dogs and have many positive traits. Once you've owned a Cocker Spaniel, I'm certain you won't want any other kind of dog! Cockers Are Happy Little Dogs! Their lively, friendly, enthusiastic nature has given them the nickname 'the merry cocker' and it's very easy to see why. They're very 'busy' little dogs and whenever you see one, he'll more than likely have his nose to the ground, bottom in the air, and he'll be either rooting around in the undergrowth or zigzagging from sniff to sniff. But whatever he's doing, his tail will be wagging back and forth so enthusiastically that his whole back end will be wagging...the tail will almost be wagging the dog! Cocker Spaniels are very intelligent and so eager to please, which makes training them a walk in the park. And let's face it, there's nothing better to see than a well-trained Cocker Spaniel! However, it's best to use positive training practices and no rough handling as they can be sensitive little souls. Cockers adore being around the family and are particularly good with young children, which is why they make good family dogs. A word of caution, however. If your Cocker is a little sensitive you will need to make sure that the kids understand how to behave around dogs. I stress this for any breed of dog, not just for the Cocker Spaniel. ...And Excellent Gun Dogs Too! Cockers have a medium to high prey drive making them excellent gun dogs. Their willingness to work is astonishing (they're almost tireless!) and their original hunting instincts are never very far below the surface. Please be aware: a farmer has the right to shoot your dog if he's caught chasing livestock! My dog Max is testament to that because he'll chase just about anything that moves when we're out in the vineyards! A word to the wise. Unfortunately some Cockers have a tendency to chase cows and sheep, and in particular, newborn lambs. Even if your dog is well-trained, it's a good idea to put him back on the lead if you're about to enter a field with animals. This is even more important if your Cocker's prey drive is high! If you're expecting your Spaniel to be an effective guard dog, you can forget it! Cocker Spaniel temperaments are too gentle to make good guard dogs. Although not generally known as nuisance barkers, they will almost certainly bark to let you know that there's someone coming to the front door, but that's probably as far as it goes. They make friends very easily and once your visitor has said 'hello', and your dog has had a good old sniff, he'll probably go merrily about his business. Cockers love going for long walks through woods and love to run through fields and swim in rivers whenever they get the opportunity. They're very active dogs and need lots of exercise to help keep them fit and happy. A one-hour walk each day and a few minutes of playing 'fetch' should be enough, but I'm sure your Cocker won't object to more if you can manage it. Max enjoys being off the lead and running free for a while during his daily walk and he always seems better 'behaved' after a good run about. I think that's because he burns off all that excess energy and he's simply too tired to get up to mischief! It's so true what they say, a tired dog is a contented dog! Cocker Spaniels love being with their pack (you and your family) and they like to be the center of attention... and they need a fair amount of it! They shouldn't be left on their own for very long or they may become stressed and suffer from separation anxiety. They miss you so much that they become miserable, lonely, bored...and that's when the trouble begins! Left on their own for too long, they can become very destructive and develop unwanted behaviors such as chewing, barking, howling, or peeing indoors...or worse! Fortunately, there are many things you can do to help reduce your dog's separation anxiety and make his time alone bearable. It's understandable that you can't be around all the time, (even if you don't need to go out to work) so it makes sense to teach your puppy (from a very early age) to be alone for short periods of time, even if you're only in another room. Cocker Spaniels have a reputation for being possessive. They tend to resource guard and may become possessive over their food, members of their human family, or their toys. If your Cocker is in constant fear of having something taken away from him, he may become aggressive in a bid to stop it from happening. It's important not to tease your dog as this could 'teach' him to become possessive. Possessive behaviour in dogs can lead to dangerous situations. Please make sure the kids understand this! Where Cockers are possessive over their food, it's usually because they feel that their food is in danger of being taken away from them (a throw-back to the wild where only the strongest survived). Whilst you can never be certain of completely eliminating food guarding you should be able to correct the behaviour. Once a dog has displayed food aggression, there's always the possibility of this behaviour returning at some point in his life. On a positive note, if you can spot the signs of food guarding you'll be able to spring into action and avoid any 'confrontation'. You can learn more about food aggression here. Our dogs love being part of the family, but it's important that your Cocker Spaniel has exposure to all members equally, otherwise it can lead to possessiveness. If one particular family member becomes more important to your puppy (because, for example, they always feed him or walk him) it can lead to the puppy becoming aggressive towards others who approach that family member. Mum, dad, and kids, should all be involved in your puppy's daily activities (for example, feeding, walking, playing, and taking turns for cuddles). By sharing these activities you will be ensuring your dog responds to all members of your family. Sometimes Cockers can be possessive around their toys. 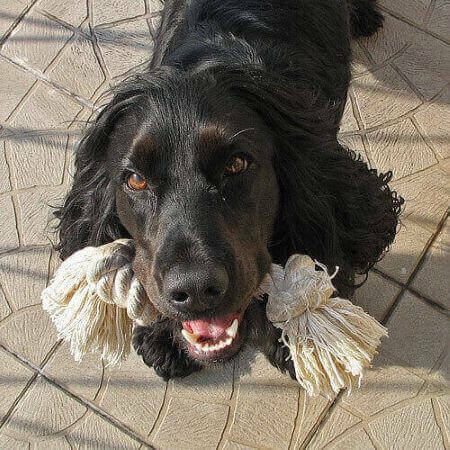 If your Cocker Spaniel won't share his toys, don't try to take them away from him as it could prove to be dangerous. Simply leave him to play on his own. If your dog has a good selection of toys he's less likely to develop resource guarding in the first place. So, Is The Cocker Dog Temperamental? The short answer is no, Cockers, generally, are not temperamental. As far as the English Cocker Spaniel temperament is concerned, these dogs are gentle, loving, loyal, and companionable. However, like most other breeds, if they're not properly socialized, well-trained, are handled roughly, or their owners are terribly inexperienced, they can become somewhat unpredictable. How this unpredictability is displayed will depend on whether the dog is strong-willed or sensitive. Cockers can sometimes be quite strong-willed (read stubborn!). This is where puppy obedience training becomes very important if you want a well-mannered little puppy that will do what you ask of him. If your pup is turning out to be quite dominant, you'll find this article about the alpha male very useful and it will show you how to manage dog behavior problems that you may see developing in your pet. It's recommended reading whether or not your dog is dominant because it will help you to teach your dog some polite manners. Although Cocker Spaniels can be strong-willed, they can also be quite sensitive too (they're such a wonderful contradiction!). A sensitive puppy may be frightened of his own shadow, pee with excitement or develop 'fear aggression'. (Timid dogs can often turn aggressive if they feel they are trapped or feel frightened). A submissive or nervous puppy will need very gentle handling and lots of early socialization. Your puppy may be naturally submissive, but a lack of socialization can result in a (more) nervous dog. On the other hand, if your puppy's nervousness is genetic and he's naturally 'skittish', socialization will help to make him more confident. It may not be enough to change his temperament but coupled with good training you may be able to improve his shyness. Whilst researching this breed, you may come across the term 'Cocker Rage Syndrome' or simply 'Cocker Rage'. Although it's a very serious condition, you don't need to worry too much about it. That's because Rage syndrome in Cocker Spaniels is extremely rare and aggressive dog behavior is very often misdiagnosed as rage syndrome. I do recommend you read more about it just to understand exactly what it is, but trust me, you are unlikely to ever see it in your lifetime (unless you're very, very, unlucky). Most aggressive behavior is more likely caused by poor socialization, a lack of training, owner inexperience, or aggressive handling. 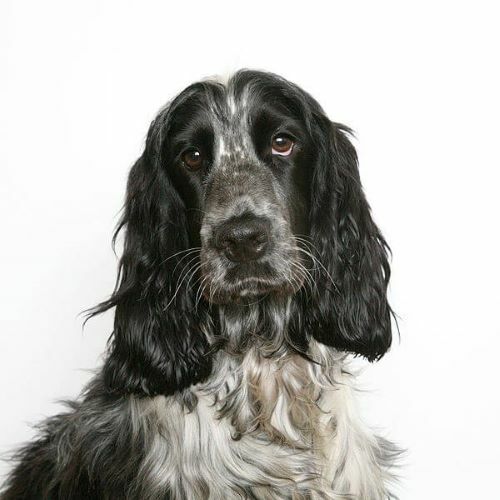 Without doubt, the Spaniel is a beautiful looking dog; their adoring brown eyes and soft droopy ears, their silky soft coat, but most of all, it's their loving temperament which makes them the most popular of the Spaniel breed. As a rule of thumb, the Cocker Spaniel temperament is just wonderful! However, Cockers can sometimes be a little sensitive and need gentle handling. By giving your puppy lots of early socialization and using positive training methods you can help to boost your pet's confidence so that he grows up to be a well-adjusted, happy Spaniel with great manners! I hope you've enjoyed reading this page and that it's helped you to decide that this is the breed for you! However, if you weren't quite convinced, (and I can't believe you're not!) 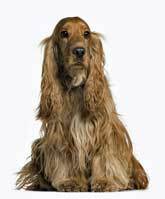 why not read a little more about the Cocker Spaniel breed before making your final decision? If you decide to plump for a Cocker Spaniel just make sure you get your puppy from a responsible Cocker breeder who breeds for temperament. The Cocker Spaniel's characteristics are totally appealing: floppy ears, soulful brown eyes, and a merrily wagging tail - how could you resist? Click on this gorgeous Cocker to learn more or follow the link above.